California Coastal Commission hopes process will help update its non-regulatory recommendations for adaption. STATEWIDE — The California Coastal Commission plans to spend the next few weeks interacting with the public at large on updating the quasi-judicial agency’s sea level rise adaptation policy. The clock on a 30-day public review period of the commission’s Residential Adaptation Policy Guidance Update – a document outlining how to prepare for predicted sea level rise – could start soon. Commission staff anticipates the public review process on the sea level rise policy document could be released in late February or early March. Coastal Commission staff hopes the public review process would help them update the Draft Residential Adaptation Policy Guidance document it released in July 2017. The revised document, which will go through its second public review period, could be in front of the full commission for a vote in May or June. The sea level rise-themed Residential Adaptation Guidance policy, according to the Coastal Commission, is intended to be a set of interpretive guidelines, not a document of regulations. 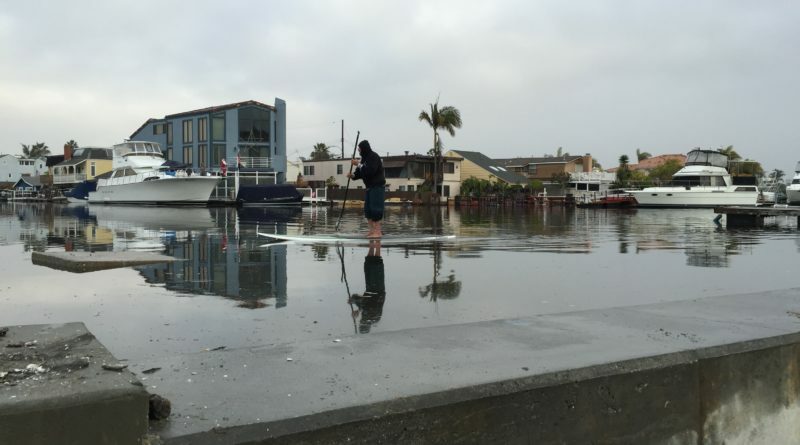 Predicted sea level rise, according to the Coastal Commission’s proposed policy guidance document, could negatively affect public access and future development patterns. Taking adaptive steps now could make it easier for policymakers and the public at large to react to changing conditions if – or when – they occur. The policy guidance document listed a handful of recommendations for cities, counties and port districts to follow in crafting a sea level rise strategy: use best available science, disclose risk to all property owners, avoid hazards through design decisions and regulate redevelopment. It was unclear, as of press time, when the 30-day public review period on the Draft Residential Adaptation Policy Guidance document would begin. The Log will update coverage on this issue as the process plays out during the coming weeks and months. The next California Coastal Commission meeting will be held March 7-9 at Oxnard Harbor District in Port Hueneme. Let me see, 20 years ago, the “experts” said that the sea level would be 1 to 2 feet higher than what was in 2000. So far it is less than an inch and we are supposed to believe these people who are blowing millions in taxpayer dollars? Really, what a fraud. More state of california waste of time and money. Very few places would be effected by a 2 or 3 foot sea level rise.